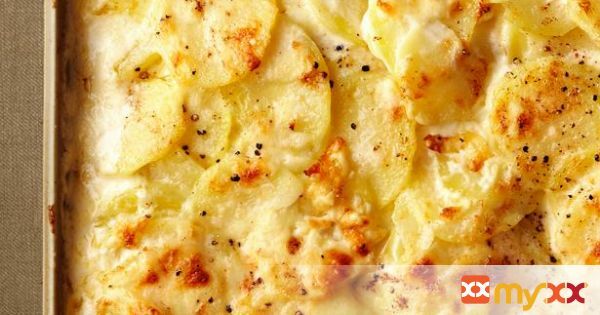 To make this decadent side dish, layer thinly sliced potatoes with heavy cream and mozzarella, Asiago and gruyere cheeses. Top with Parmesan cheese and bake until bubbly. 1. Position a rack in the upper third of the oven and preheat to 425 degrees F.
2. Generously brush a large skillet with butter, then rub with the garlic. 3. Combine the mozzarella, asiago and gruyere in a bowl. 4. Heat the skillet over medium-high heat. Add half of the potatoes, spreading them out. 5. Sprinkle with 3/4 teaspoon salt, half of the cut-up butter, half of the shredded cheese blend, and pepper to taste. 6. Arrange the remaining potatoes on top. Sprinkle with 3/4 teaspoon salt, and pepper to taste. 7. Pour the cream over the potatoes, then add the nutmeg and bay leaves; simmer 3 minutes. 8. Dot the potatoes with the remaining cut-up butter. 9. Generously brush a shallow baking dish with butter; slide the potatoes into the dish; arrange with a fork, if desired. 10. Sprinkle the potatoes with the parmesan and the remaining shredded cheese blend. 11. Bake until golden, about 25 minutes. Let rest 5 minutes before serving. Discard the bay leaves.